In modern society, online dating is becoming more and more popular, because it’s definitely a fast and effective to find a lifetime partner if you use the right way to go! This uprising dating method does bring convenience and benefits; meanwhile, it hides risks of being scammed. ChnLove, as the #1 trusted online dating platform in Asia, quite understands the significance of safety and security, and has adopted an effective system to keep its members away from scams. Below, we will get further into this topic. First of all, all the lady profiles on ChnLove.com are strictly confirmed. Ladies’ profiles marked with ‘Verified’ icon mean they have finished the ‘Identity Authentication’ and ‘SMS Verification’ processes. This is no doubt an effective step to keep the potential scammers away at the initial stage. For those ladies who can’t be reached or suspected by the male members, their profiles would be defined as suspicious profiles and will be closely monitored. 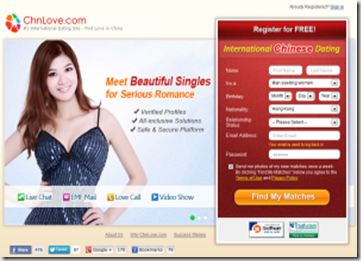 Apart from the strict control on the ladies’ profiles, ChnLove also adopted a series of Anti-Scam measures toward its cooperated dating agencies. The best testimonial is that ChnLove has built a feedback rating system which allows male members to assess the performance of the agencies. Periodically, ChnLove will check the quality of translated correspondences and related services offered by the local agencies. Besides, ChnLove regularly conducts phone interview with the ladies for the manners their corresponding agencies serving them. This process is to make sure the agencies completely comply with our practice and procedures. In the following paragraph, I will cite an typical example about online dating scam and see how we deal with it. We always encourage our male members to inform us immediately when a scam is suspected. Receiving the feedback, our Customer Service Team will try all the best to figure out a satisfactory solution once they confirmed the scam issue really exists. The lady and relevant agency would be disciplinarily punished and the male members who are the victim of such scam issue will be compensated accordingly. Recently, we have received a message from one of our gentlemen, complaining that the photos of the Chinese girl who he is communicating with are taken from the internet. Upon receiving the scam reporting, our related staff make thorough investigation accordingly. Before we come to a solution, the lady’s profile is taken off from the international site. Our staff later contacted the lady and asked her for recent photos so as to confirm her identity. However, this lady rejected to cooperate with us. Therefore,we remove her profile from our site permanently. Two credits were refunded to the male members for the EMF Mails spending. ChnLove is trying its best to make sure the safety of the male members; however, we can’t 100% guarantee the true intent of every individual. Thus, we need you, our gentlemen members, to actively cooperate with us and raise the attention to avoid online dating scams.While when the scam issues are confirmed, we will adopt necessary measures to rectify the situation immediately.